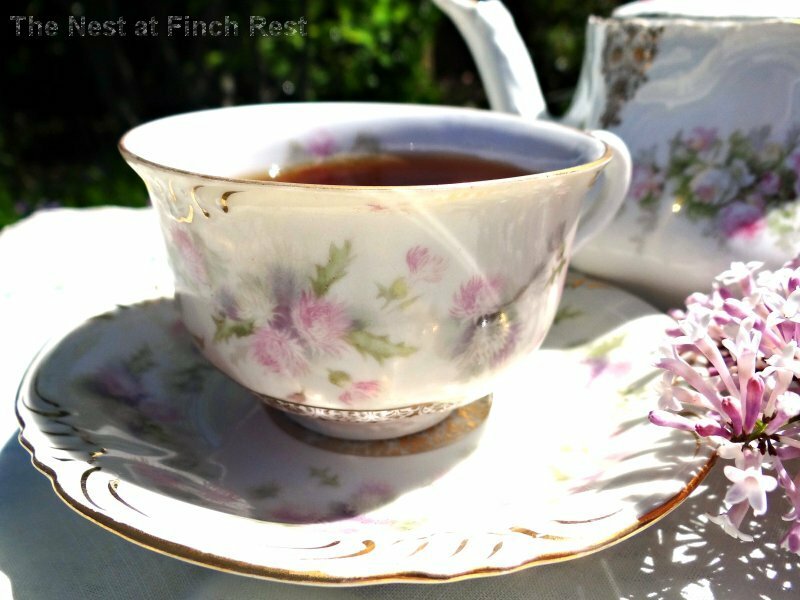 I posted about my lilac bush finally blooming this week and thought I would continue sharing the loveliness and garden mood with a little late-day tea time in a shady garden spot! Having all these shadows aren't great for producing wonderful pictures, but the cool & shaded respite was worth it for me. 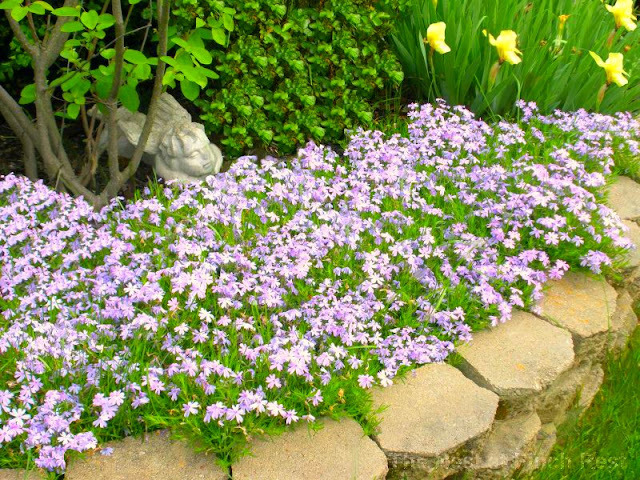 See the stone angel resting amongst the purple phlox and violas? 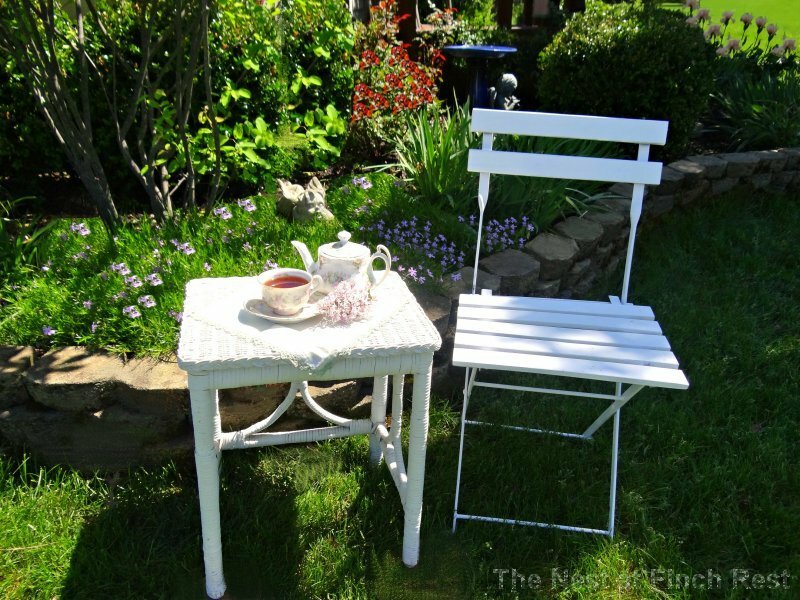 That cute little old white wicker table is yet another GW thrifty find. It makes for extra seating when needed, too. Gotta love double duty! This teacup matches the small plates from a recent Mother's Day tablescape tea post here in case you missed it. This teapot is also very old Bavarian....my all-time favorite to collect. 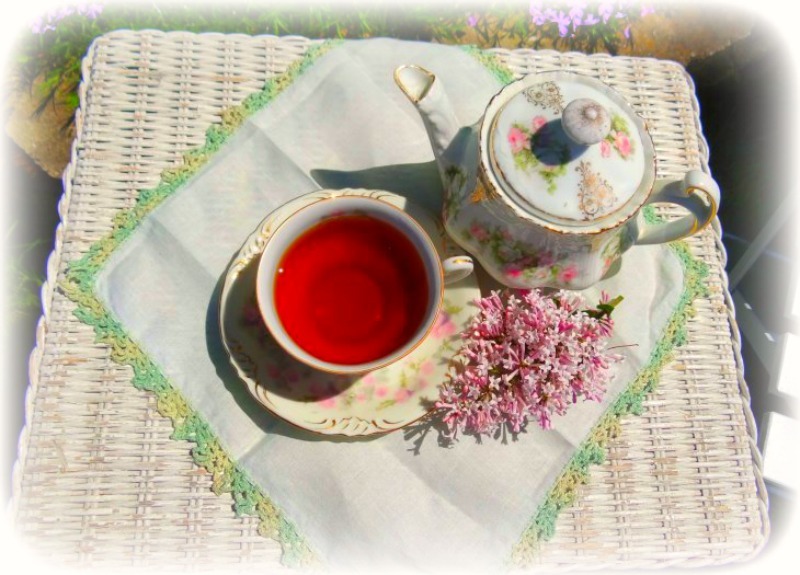 I love a luscious red Roobios tea - one of the very few I sweeten. I used honey from a relatively new acquaintance of my DH's from work. 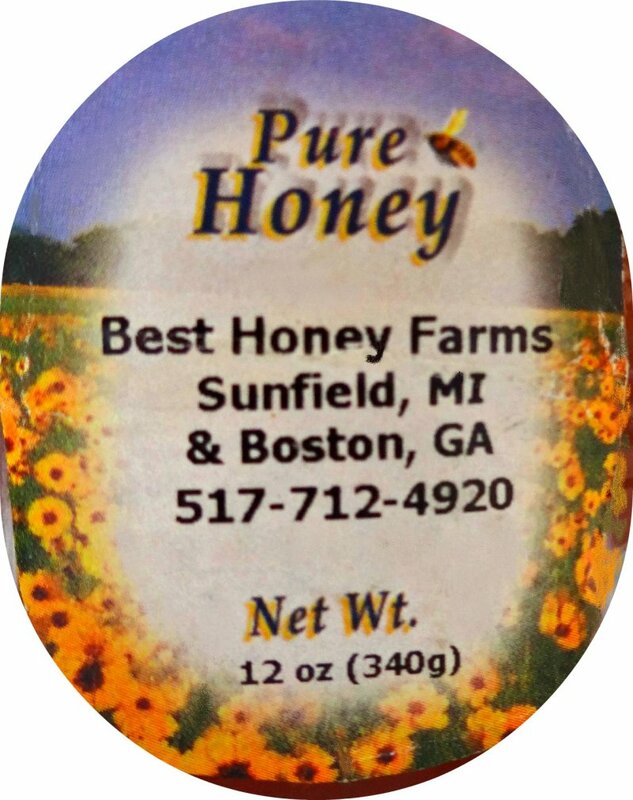 (His family produces honey in Michigan and in Georgia.) 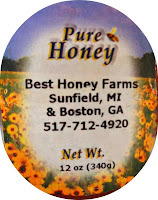 Here is the label from one of the honey bears he gave us. Good stuff, highly recommend it. There are many shades of purple in our gardens this time of year, including this purple Iris. It is much smaller, thinner and shorter than the peach Iris next to it. How I long to have each one of you for tea and a nice visit in a quiet shady part of our garden. And looking at this now I see that my yellow Iris have come and gone already and that I hardly noticed the yellow Iris blooming this year. As always, thank you for taking the time to drop by and share a few moments with me. it really means the world to me. What a beautiful setting for a cup of tea! Your blooms are all doing so well. 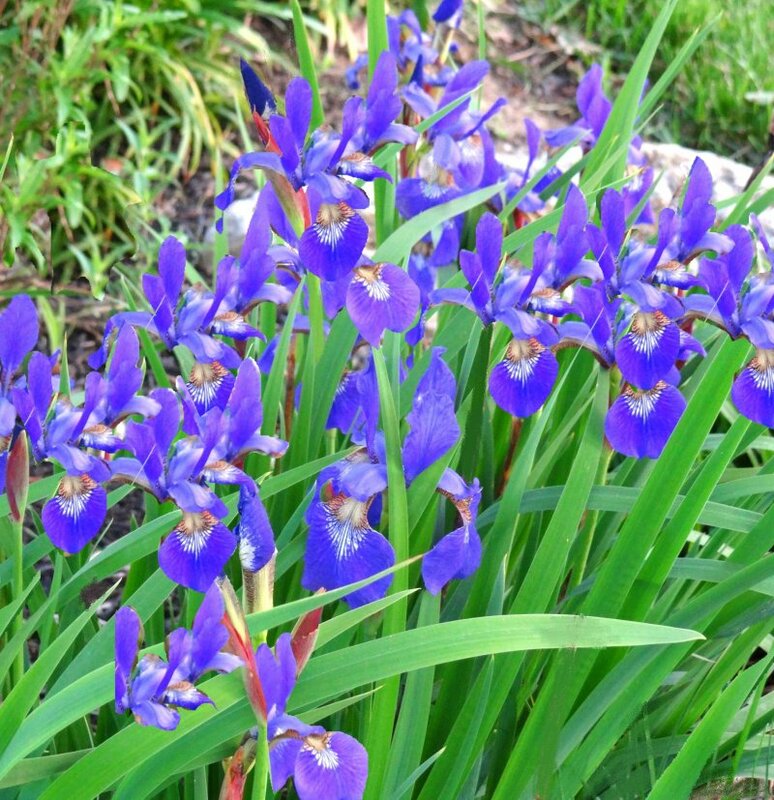 The irises are so pretty. Mine never look that good! Michele, your tea is in such a pretty setting and I love your china. LOVE the teapot! 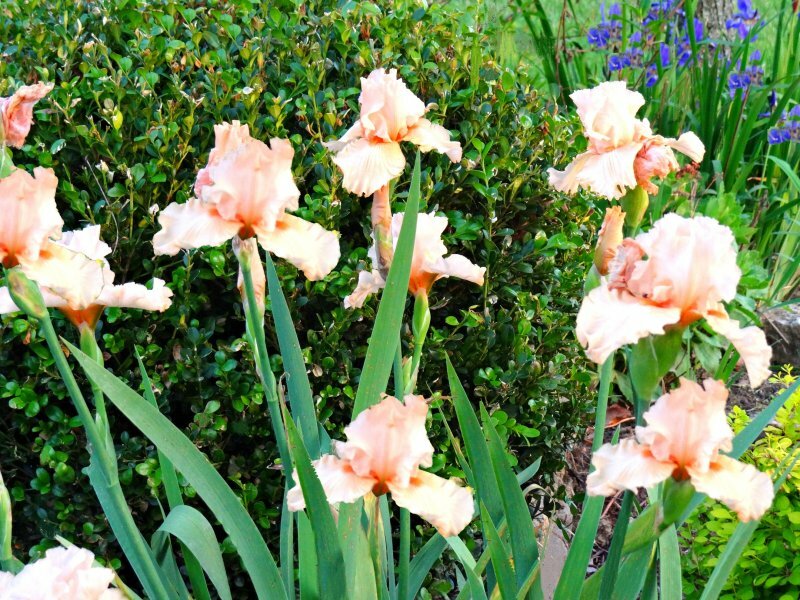 Your irises are just beautiful! Thanks for joining me for tea today and enjoy your week. It was very hot here today...it as a record settingh 90 degrees. And walking through your garden has been a refreshing reprise from the heat. itting down with you at your beautiful tea setting....well how relaxed I feel. Thank you for ending my day so wonderfully. Loved it. PS I posted last night at 2am but put in for the 14th when it was suppose to be posted. I added to my post. Thankyou dear friend for that gorgeous arrangement. 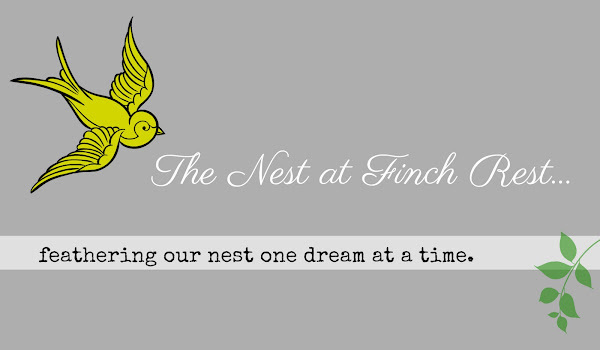 Today is my 6 month blogging anniversary and I'm celebrating by Paying it Forward...a very special and wonderful way to bless the life of another as you have blessed mine. lovely little table and chair, michele:) add a magazine and i'd be in heaven! Michele, I can see why that teapot is your favorite! Oh my goodness, it is precious. What great finds from the GW, too!! I love the cherub in the garden. I have angels in my house...love them!! I wish I could share a cup of tea with you in your pretty garden. Beautiful post! i love your teapot and teacup. what a darling post here - great table and chair and that teapot is so beautiful! Thanks for joining in at Tea in the Garden! The photos are mesmerizing...I love visiting you! The fragrance of lilacs is soothing to me..I often pick some on my way into work and put them on my desk! Brightens the spirit! 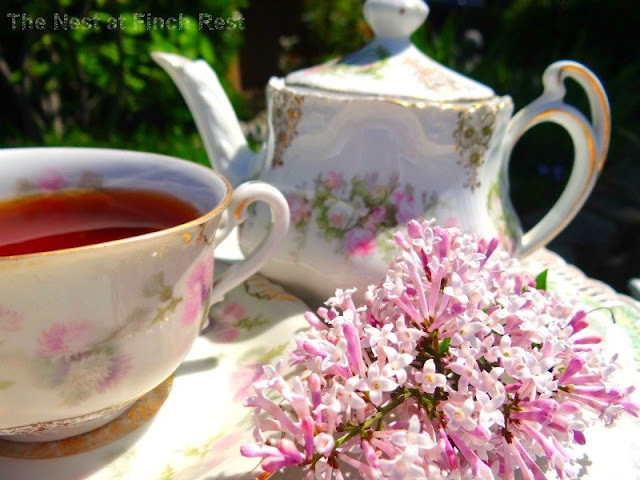 What a beautiful tea setting in your gardens. I love your purple iris, violas and phlox...so pretty. I bought some lavender to add to my garden this year. I love the color purple! 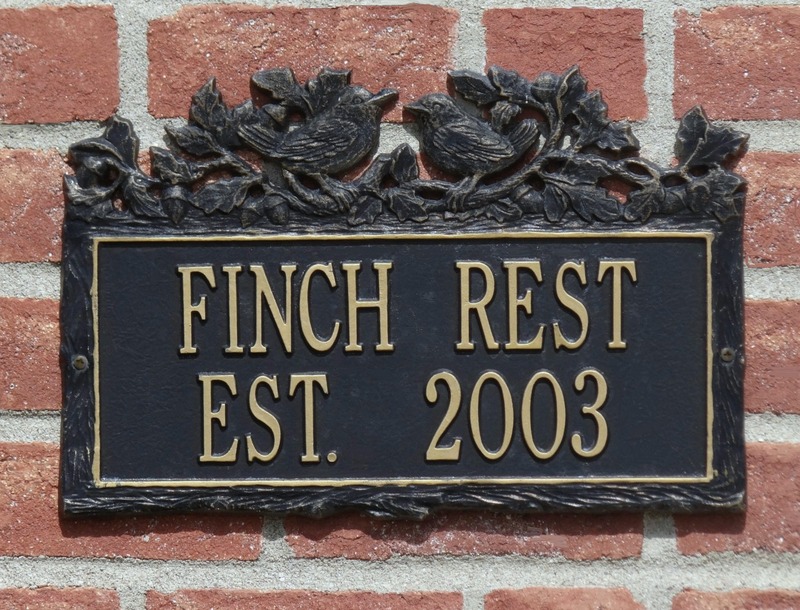 Thanks for sharing your gardens. precious little spot for tea w/ beauty to refresh and inspire! i absolutely love the bavarian teapot and cup ! carryon b/c i wouldn't trust it to checked !! all safely home and luved when i get to my country home for summer!